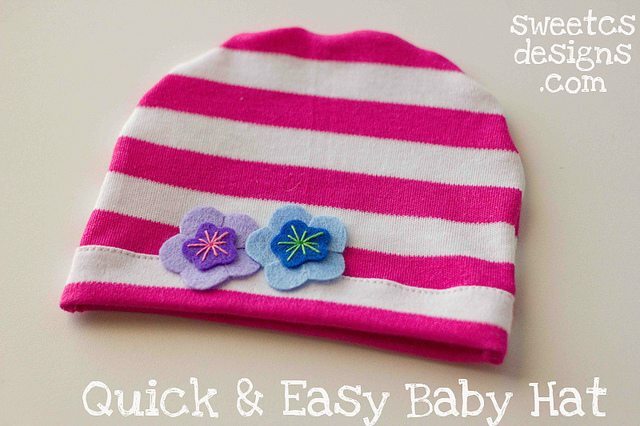 Quick and Easy Baby and Kids Hats! I originally posted these lovely little hats over at Sweet C’s Designs last year- but I have been itching to share them with you here. They are fabulous and such a perfect quick craft for cool weather- and make fabulous gifts for new moms or friends that are expecting. They are also awesome gifts for bigger kids if you use a thicker fabric like an old sweater or fleece! I am making soft jersey knit baby sized caps in this demo, but the technique works fabulously with fleece for bigger hats for older kids, too! First, cut out your fabric. I used a baby cap I already had on hand as a size guide. Next, make a “cuff” on the right side of each piece of fabric by folding the fabric over twice. Use a straight stitch across the width of the hat. (If your fabric is not double sided, you might want to attach a coordinating fabric onto the backside of your hat pieces so your cuff looks good- or you can sew a cuff by folding the right side onto the inside of the fabric- this is just to make a finished edge). Next, pin your fabric sides together, inside out. Sew along the sides and top of the hat. You can use a straight stitch for baby caps, but I would suggest a double stitch for hats that have move active users. Flip right side out, you’re done! I added some simple felt embellishments onto this hat that I absolutely love. You could add embellishments, silk screen a design, add on some blinged ribbon- the sky is the limit! Who would you make these easy hats for this winter?